In this meditation retreat we will use rock climbing to come closer to ourself. Climbing brings a natural focused concentration and can be very quiet and meditative; It also invites us into an intimate relationship with nature as we touch the rocks and feel the strength. In climbing, we get to know our limits, we need to be aware of our strength, we learn to move mindfully and above all: It brings us into the moment. At the same time we learn how to deal with emotions and take the lessons learned into our everyday life – themes that accompany advanced rock climbers just as much as beginners. During this retreat, we will explore how our experience of climbing during the day and our mornings and evenings meditations can lead us to a more balanced and stable way of living. We will explore the beauty and depth of being fully attentive, and learn how to transfer that way of being into our daily life. However to us meditation means the ability to observe and is not tied to any belief system. Since this week is about deepening our inner exploration, practitioners of all levels of both rock climbing and meditation are welcome. Like in the years before Robert will guide us very well to the easier and more difficult climbing routes according to our needs and eagerness for challenge. Meditations stays challenging for most practitioners and Denis has a great gift for guiding us in a very practical way. 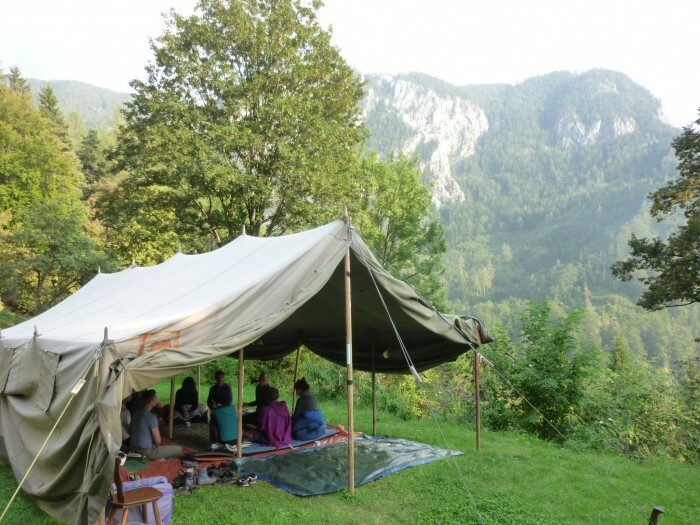 The Bergzendo is a fantastic, newly renovated house by a Zen Group, based in Vienna. It is only one hour away from Vienna, and has diverse climbing areas for all levels. The isolated house offers accommodation in several double rooms and there is also the opportunity to stay in tents. We will prepare some of the vegan and vegetarian meals together, and and food allergies can be catered for if necessary. Robert Kerneza is one of Austria’s finest rock climbers. As a certified mountain­guide he will provide the climbing know­how and safety support for this retreat. He has been climbing for over 35 years and invites us on this retreat to the rocks of his youth. With its quiet mountain mentality and vast ecological knowledge his teachings are deeply rooted in nature. Denis Robberechts will lead the meditations. He has spent more than seven years in India to devote himself to meditation and Indian classical music. As an experienced meditation teacher his clear and practical guidance helps us to find a clear approach to meditation. The many active elements (climbing, hiking, cooking) will support the transfer of this clarity into everyday life. There will be more information in November 2018. The retreat will be held in English. We will have vegetarian and vegan meals, and there is room to care about food allergies if necessary. “The best thing was meeting the rock face to face, and finding a new power within myself to be really focussed. To be in my whole body, especially my feet and hands – as a matter of urgency, not just a lazy pleasure!